Versowa - meherbabatravels jimdo page! The name of this ship in the book " Lord Meher " is " VERSOVA ". Unfortunately, apart from the 2 entries in the two books there is NO further information. At this point in time, both spellings are valid. Meher Baba left Bombay by the steamship Versowa on 20th September. A great crowd came to see him off, including some Parsee ladies and he was garlanded with flowers. But Baba travelled third class on the open deck, much to the surprise of the captain and officers of the ship. This ship took Baba and his men mandali to Persia via Karachi. At quarter past nine on the morning of September 20th, 1929, Kaka Baria drove Baba and the mandali to Victoria Docks. Several of the Master's devotees had come from Poona, Ahmednagar and Bombay to bid him farewell. Mother Shireen and Gulmai were the first to garland Baba. The group boarded the S. S. Versova and sailed off at eleven o'clock that evening. Cheering, all his devotees joined in a hearty bon voyage. His close lovers were waving kisses with such depth of feeling it seemed as if they were bidding farewell to the very source of their being. On board the ship, it was puzzling to the other passengers to see the one who was given such a loving and grand sendoff occupy an open space on the deck. A rich Parsi merchant from Nasik named Burjor F. Joshi whispered to Chanji, "A saint of Meher Baba's calibre should not travel third class. I will arrange a special cabin for him." 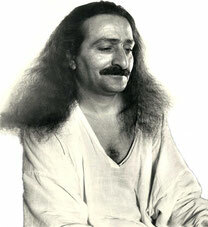 Chanji explained that Meher Baba always traveled third class. Not satisfied, the man approached Baba directly and pleaded, "The deck is no place for a person of your saintly status. Permit me to arrange a cabin for you and your companions in first class." Baba gestured in reply, "I am quite happy where I am. There are several further pages of this journey to Persia which I have not included.